In natural philosophy, atomism is the theory that all the objects in the universe are composed of very small, invisible, indestructible building blocks—atoms. The word atomism derives from the ancient Greek word atomos, which means "that which cannot be cut into smaller pieces." Traditional atomism is used in two distinct domains: The atoms of physical science, and that of philosophy. Atomism is traditionally associated with the latter, where philosophers have argued that the basic building blocks of reality, and which make up absolutely anything that exists, are incredibly tiny objects that do not have physical parts, cannot be split, divided or cut, and which are either point-sized (sizeless) or they have a tiny size. Those that have a tiny size are called Democritean atoms. This was the case for the Greek theories of atomism. Indian Buddhists, such as Dharmakirti and others, also contributed to well-developed theories of atomism that involve momentary (instantaneous) atoms that flash in and out of existence. Atomism became immensely popular in the early nineteenth century, when scientists like Dalton posited that all substances were made up of but a few elements which consist of indivisible atoms. However, in the twentieth century, these uncuttable "atoms" were found to be composed of even smaller entities: Electrons, neutrons, and protons. Further experiments showed that protons and neutrons are made of even more fundamental quarks. The trend of empirical evidence for ever-smaller subatomic particles raises the question of matter being infinitely divisible. 2.1 Is there an ultimate, indivisible unit of matter? Yet even if a theoretical smallest particle could be found, with the advent of quantum theory, atomism could no longer be sustained. Its downfall came with the discovery of the wave-particle duality, that all such point-like particles are simultaneously waves whose extension in space is theoretically unbounded. Sometimes, matter behaves like particles; other times like waves. Thus, the historical position of atomism should be seen as but one way of looking at a more complex reality that is both local and global, discrete and holistic at the same time. Traditional atomism, derived from the word atom, is used in two distinct domains: The atoms of physical science, and that of philosophy. Atomism is traditionally associated with the latter, where philosophers have argued that the basic building blocks of reality, and which make up absolutely anything that exists, are incredibly tiny objects that do not have physical parts, cannot be split, divided or cut, and which are either point-sized (sizeless) or they have a tiny size. Those that have a tiny size are called Democritean atoms. This was the case for the Greek theories of atomism. Indian Buddhists, such as Dharmakirti and others, also contributed to well-developed theories of atomism that involve momentary (instantaneous) atoms that flash in and out of existence. The tradition of atomism leads to the position that only atoms exist, and there are no composite objects (objects with parts), which would mean that human bodies, clouds, planets, etc., all do not exist. This consequence of atomism was openly discussed by atomists such as Democritus, Hobbes, and perhaps even Kant (there is a debate over whether or not Kant was an atomist) among others, and it is also called mereological nihilism or metaphysical nihilism. In contemporary philosophy, atomism is not as popular as it has been in past times, because many contemporary philosophers are not willing to argue that only atoms exist, wherein there are not any things like trees, etc. Simples theory is a similar theory to atomism, but where, unlike mereological nihilism, philosophers do hold that more than just atoms exist (such as cars and trees made up of the atoms). Accordingly, the term "social atomism" is used to denote the point of view that individuals rather than social institutions and values are the proper subject of analysis, since all properties of institutions and values merely accumulate from the striving of the individual. Similarly, Bertrand Russell developed "logical atomism" in an attempt to identify the atoms of thought, the pieces of thought that cannot be divided into smaller pieces of thought. A new twist was given to the ancient conundrum of the divisibility of matter by the discovery of quantum mechanics. Until then, no distinction was made between dividing a piece of matter and cutting it into smaller pieces; hence the frequent translation of the Greek word átomos (ἄτομος) as "indivisible" in place of "uncuttable." Whereas the modern atom is indeed divisible, it is actually not cuttable: There is no partition of space such that its parts correspond to parts of the atom. In other words, the quantum-mechanical description of matter no longer conforms to the Cookie cutter paradigm. In the late fifth century B.C.E., Democritus and Leucippus taught that the hidden substance in all physical objects consists of different arrangements of 1) atoms and 2) void. Both atoms and the void were never created, and they will be never ending. Democritus became famous for this idea, but he followed closely what his teacher, Leucippus, taught (Lloyd 1970, 45-48). No word written by Leucippus has survived, and of the writings of Democritus have brought forth only a few unhelpful fragments. The void is infinite and provides the space in which the atoms can pack or scatter differently. The different possible packings and scatterings within the void make up the shifting outlines and bulk of the objects that people feel, see, eat, hear, smell, and taste. While one may feel hot or cold, hot and cold actually have no real existence. They are simply sensations produced in one by the different packings and scatterings of the atoms in the void that compose the object that one senses as being "hot" or "cold." The work of Democritus has survived only in secondhand reports, sometimes unreliably or conflicting. Much of the best evidence is that reported by Aristotle in his criticisms of atomism, who regarded him as an important rival in natural philosophy. His ideas are also represented in the derivative works of Democritus's followers, such as Lucretius's On the Nature of Things. These derivative works allow one to work out several segments of his theory on how the universe began its current stage. The atoms and the void are eternal. And after collisions that shatter large objects into smaller objects, the resulting dust, still composed of the same eternal atoms as the prior configurations of the universe, falls into a whirling motion that draws the dust into larger objects again to begin another cycle. Philosophers often credit Democritus with the idea that humans created gods; the gods did not create humanity. For example, Sextus noted, "Some people think that we arrived at the idea of gods from the remarkable things that happen in the world. Democritus … says that the people of ancient times were frightened by happenings in the heavens such as thunder, lightning, … and thought that they were caused by gods" (Taylor 1999, p. 140). According to Democritus, the workings of the universe are entirely mechanical, driven by what he called the "vibrations," the velocities and impacts of the constituent atoms. He explained that things happen because of what he called "necessity," the mechanistic collisions and aggregations of the atoms according to their own "nature." Plato (c. 427—c. 347 B.C.E.) objected to the mechanistic purposelessness of the atomism of Democritus. He argued that atoms just crashing into other atoms could never produce the beauty and form of the world. In the Timaeus, (28B - 29A) Plato insisted that the cosmos was not eternal but was created, although its creator framed it after an eternal, unchanging model. One part of that creation were the atoms of fire, air, water, and earth. But Plato—under the influence of Pythagorean geometry and number theory—did not consider the atoms to be the most basic level of reality, for in his view they were made up of an unchanging level of reality, which was mathematical. The atoms were geometric solids, the faces of which were, in turn, made up of triangles. The square faces of the cube were each made up of four isosceles right-angled triangles and the triangular faces of the tetrahedron, octahedron, and icosahedron were each made up of six right-angled triangles. He postulated the geometric structure of the atoms of the four elements as summarized in the table to the right. The cube, with its flat base and stability, was assigned to earth; the tetrahedron was assigned to fire because its penetrating points and sharp edges made it mobile. The points and edges of the octahedron and icosahedron were blunter and so these less mobile bodies were assigned to air and water. Since atoms could be decomposed into triangles, and the triangles reassembled into atoms of different elements, Plato's model offered a plausible account of changes among the primary substances (Cornford 1957, 210-239; Lloyd 1970, 74-7). Sometime before 330 B.C.E. Aristotle asserted that the elements of fire, air, earth, and water were not made of atoms, but were continuous. Aristotle considered the existence of a void, which was required by atomic theories, to violate physical principles. Change took place not by the rearrangement of atoms to make new structures, but by transformation of matter from what it was in potential to a new actuality. A piece of wet clay, when acted upon by a potter, takes on its potential to be an actual drinking mug. 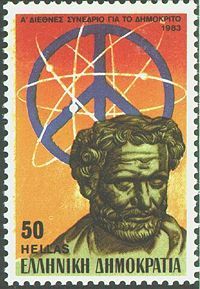 Aristotle has often been criticized for rejecting atomism, but in ancient Greece the atomic theories of Democritus and Plato remained "pure speculations, incapable of being put to any experimental test. Granted that atomism was, in the long run, to prove far more fruitful than any qualitative theory of matter, in the short run the theory that Aristotle proposed must have seemed in some respects more promising" (Lloyd 1968, 165). Epicurus (341-270) studied atomism with Nausiphanes who had been a student of Democritus. Although Epicurus was certain of the existence of atoms and the void, he was less sure one could adequately explain specific natural phenomena, such as earthquakes, lightning, comets, or the phases of the Moon (Lloyd 1973, 25-6). Few of Epicurus's writings survive and those that do reflect his interest in applying Democritus's theories to assist people in taking responsibility for themselves and for their own happiness—since he held there are no gods around that can help them. Three hundred years later, Lucretius in his epic poem On the Nature of Things would depict Epicurus as the hero who crushed the monster Religion through educating the people in what was possible in the atoms and what was not possible in the atoms. However, Epicurus expressed non-aggression to Religion or any other face of violence in the following statement. "The man who best knows how to meet external threats makes into one family all the creatures he can; and those he can not, he at any rate does not treat as aliens; and where he finds even this impossible, he avoids all dealings, and, so far as is advantageous, excludes them from his life." However, scholars still had Aristotle’s critiques of atomism, and it seems unlikely that all ideas of atomism could have been lost in the West. In the Medieval universities there were rare expressions of atomistic philosophy. For example, in the fourteenth century Nicholas of Autrecourt considered that matter, space, and time were all made up of indivisible atoms, points, and instants and that all generation and corruption took place by the rearrangement of material atoms. The similarities of his ideas with those of al-Ghazali suggest that Nicholas may have been familiar with Ghazali's work, perhaps through Averroes' refutation of it (Marmara, 1973-74). Still, “the exile of the atom” is an appropriate description of the interim between the ancient Greeks and the revival of Western atomism in the sixteenth century, in view of atomism’s success elsewhere during that time. If the atom was in exile from the west, it was in India and Islam that atomistic traditions continued. The Indian atomistic position, like many movements in Indian Philosophy and Mathematics, starts with an argument from Linguistics. The Vedic etymologist and grammarian Yaska (c. seventh century B.C.E.) in his Nirukta, in dealing with models for how linguistic structures get to have their meanings, takes the atomistic position that words are the "primary" carrier of meaning—that is, words have a preferred ontological status in defining meaning. This position was to be the subject of a fierce debate in the Indian tradition from the early Christian era until the eighteenth century, involving different philosophers from the Nyaya, Mimamsa, and Buddhist schools. In the prAtishAkhya text (c. second century B.C.E. ), the gist of the controversy was stated cryptically in the sutra form as "saMhitA pada-prakr^tiH." According to the atomist view, the words (pada) would be the primary elements (prakr^ti) out of which the sentence is constructed, while the holistic view considers the sentence as the primary entity, originally "given" in its context of utterance, and the words are arrived at only through analysis and abstraction. These two positions came to be called a-kShaNDa-pakSha (indivisibility or sentence-holism), a position developed later by Bhartrihari (c. 500 C.E. ), and kShaNDa-pakSha (atomism), a position adopted by the Mimamsa and Nyaya schools. The ancient “shAshvata-vAda” doctrine of eternalism, which held that elements are eternal, is also suggestive of a possible starting point for atomism (Gangopadhyaya 1981). There has been some debate among scholars as to the origin of Indian atomism; the general consensus is that the Indian and Greek versions of atomism developed independently. However, there is some doubt on this, given the similarities between Indian atomism and Greek atomism and the proximity of India to scholastic Europe, as well as the account, related by Diogenes Laertius, of Democritus "making acquaintance with the Gymnosophists in India." In any event, the earliest schools of Indian atomism (in the linguistic tradition), as well as certain epistemological positions, such as the materialist Uddalaka, were developed before Greek positions associated with philosophers such as Leucippus and Democritus. The atomist position had transcended language into epistemology by the time (around 100 C.E.) that Nyaya-Vaisesika, Buddhist, and Jaina theology were developing mature philosophical positions. The Nyaya-Vaisesika school developed one of the earliest forms of atomism; scholars date the Nyaya and Vaisesika texts from the sixth century B.C.E. to the first century B.C.E. Like the Buddhist atomists, the Vaisesika had a pseudo-Aristotelian theory of atomism. They posited the four elemental atom types, but in Vaisesika physics atoms had 24 different possible qualities, divided between general (intensive and extensive properties|extensive) properties and specific (intensive) properties. Like the Jaina school, the Nyaya-Vaisesika atomists had elaborate theories of how atoms combine. In both Jaina and Vaisesika atomism, atoms first combine in pairs (dyads), and then group into trios of pairs (triads), which are the smallest visible units of matter. This is an interesting analogy to keep in mind when considering the fact that in the modern elementary particle theory, pairs or triplets of quarks combine to create most typical forms of matter. The Buddhist atomists had very qualitative, Aristotelian-style atomic theory. According to ancient Buddhist atomism, which probably began developing before the fourth century B.C.E., there are four kinds of atoms, corresponding to the standard elements. Each of these elements has a specific property, such as solidity or motion, and performs a specific function in mixtures, such as providing support or causing growth. Like the Hindu Jains, the Buddhists were able to integrate a theory of atomism with their theological presuppositions. Later Indian Buddhist philosophers, such as Dharmakirti and Dignāga, considered atoms to be point-sized, durationless, and made of energy. The most elaborate and well-preserved Indian theory of atomism comes from the philosophy of the Jaina school, dating back to at least the first century B.C.E. Some of the Jaina texts that refer to matter and atoms are Panchastikayasara, Kalpasutra, Tattvaarthasutra and Pannavana Suttam. The Jains envisioned the world as consisting wholly of atoms, except for souls. Paramāņus or atoms were considered as the basic building blocks of all matter. Their concept of atoms was very similar to classical atomism, differing primarily in the specific properties of atoms. Each atom, according to Jaina philosophy, has one kind of taste, one smell, one color, and two kinds of touch, though it is unclear what was meant by “kind of touch.” Atoms can exist in one of two states: subtle, in which case they can fit in infinitesimally small spaces, and gross, in which case they have extension and occupy a finite space. Certain characteristics of Paramāņu correspond with that sub-atomic particles. For. Eg. Paramāņu is characterized by continuous motion either in a straight line or in case of attractions from other Paramāņus, it follows a curved path. This corresponds with the description of orbit of electrons across the Nucleus. Ultimate particles are also described as particles with positive (Snigdha i.e. smooth charge) and negative (Rūksa, rough) charges that provide them the binding force.Although atoms are made of the same basic substance, they can combine based on their eternal properties to produce any of six “aggregates,” which seem to correspond with the Greek concept of “elements:" Earth, water, shadow, sense objects, karmic matter, and unfit matter. To the Jains, karma was real, but was a naturalistic, mechanistic phenomenon caused by buildups of subtle karmic matter within the soul. They also had detailed theories of how atoms could combine, react, vibrate, move, and perform other actions, all of which were thoroughly deterministic. Indian atomism in the Middle Ages was still mostly philosophical and/or religious in intent, though it was also scientific. Because the “infallible Vedas,” the oldest Hindu texts, do not mention atoms (though they do mention elements), atomism was not orthodox in many schools of Hindu philosophy, although accommodationist interpretations or assumptions of lost text justified the use of atomism for non-orthodox schools of Hindu thought. The Buddhist and Jaina schools of atomism however, were more willing to accept the ideas of atomism. Atomistic philosophies are found very early in Islam, and represent a synthesis of the Greek and Indian ideas. Like both the Greek and Indian versions, Islamic atomism was a charged topic that had the potential for conflict with the prevalent religious orthodoxy. Yet it was such a fertile and flexible idea that, as in Greece and India, it flourished in some schools of Islamic thought. The most successful form of Islamic atomism was in the Asharite school of philosophy, most notably in the work of the philosopher al-Ghazali (1058-1111). In Asharite atomism, atoms are the only perpetual, material things in existence, and all else in the world is “accidental” meaning something that lasts for only an instant. Nothing accidental can be the cause of anything else, except perception, as it exists for a moment. Contingent events are not subject to natural physical causes, but are the direct result of God’s constant intervention, without which nothing could happen. Thus, nature is completely dependent on God, which meshes with other Asharite Islamic ideas on causation, or the lack thereof (Gardet 2001). Other traditions in Islam rejected the atomism of the Asharites and expounded on many Greek texts, especially those of Aristotle. An active school of philosophers in Spain, including the noted commentator Averroes (1126-1198 C.E. ), explicitly rejected the thought of al-Ghazali and turned to an extensive evaluation of the thought of Aristotle. Averroes commented in detail on most of the works of Aristotle and his commentaries did much to guide the interpetation of Aristotle in Jewish and Christian scholastic thought. His works were neglected in the Islamic world, however. Aristotle held sway in the universities of Europe for most of the Middle Ages, and even through the time of Newton Aristotelian physics was the standard, although other theories were beginning to be introduced to university curricula by then (Kargon 1966). By the late sixteenth century, criticism of Aristotle was mounting. Experimental philosophy was gaining ground, and with the evidence weighing in against the old physics, atomism soon reappeared in new forms. The main figures in the rebirth of atomism were Rene Descartes, Pierre Gassendi, and Robert Boyle, but there were many important ancillary figures as well. One of the first groups of atomists in England was a cadre of amateur scientists known as the Northumberland circle, led by Henry Percy (1585-1632 C.E. ), the 9th Earl of Northumberland. Although they published little of account, they helped to disseminate atomistic ideas among the burgeoning scientific culture of England, and may have been particularly influential to Francis Bacon, who became an atomist around 1605, though he later rejected some of the claims of atomism. Though they revived the classical form of atomism, this group was among the scientific avant-garde: The Northumberland circle contained nearly half of the confirmed Copernicans prior to 1610 (the year of Galileo’s The Starry Messenger). Other influential atomists of late sixteenth and early seventeenth centuries include Giordano Bruno, Thomas Hobbes (who also changed his stance on atomism late in his career), and Thomas Hariot. A number of different atomistic theories were blossoming in France at this time, as well (Clericuzio 2000). A more well-known advocate of atomism in the early sixteenth century was Galileo Galilei (1564-1642 C.E.). He first published a work based on atomism in 1612, Discourse on Floating Bodies (Redondi 1969). In The Assayer, Galileo offered a more complete physical system based on a corpuscular theory of matter, in which all phenomena—with the exception of sound—are produced by “matter in motion.” Galileo found some of the basic problems with Aristotelian physics through his experiments, and he utilized a theory of atomism as a partial replacement, but he was never unequivocally committed to it. For example, his experiments with falling bodies and inclined planes led him to the concepts of circular inertial motion and accelerating free-fall. These notions contradicted the Aristotelian theories of impulse and natural place, which dictated that bodies fall equal distances in equal times and all motion (except that of the heavens) is finite. Atomism could not explain the law of fall, but was consistent with his concept of inertia, since motion was conserved in ancient atomism (but not in Aristotelian physics). Galileo scholar Pietro Redondi has even suggested that the root of the church’s persecution of Galileo was his rejection of Aristotelian philosophy and championing of atomism (Redondi 1969). Although that was certainly not the whole story behind the so-called Galileo Affair, it is another intriguing element and may have a germ of truth. Despite the success (and controversy) generated by sixteenth and seventeenth century atomists, atomism was not fully revived until Descartes and Gassendi published their new physics systems based on corpuscular (in the case of Descartes) and atomistic (in the case of Gassendi) theories. Descartes’ mechanical philosophy of corpuscularism had much in common with atomism, and may be considered in some sense another version of it. Descartes (1596-1650 C.E.) thought everything physical in the universe to be made of tiny “corpuscles” of matter. Like the ancient atomists, Descartes claimed that sensations, such as taste or temperature, are caused by the shape and size of tiny pieces of matter. The main difference between atomism and corpuscularism was the existence of the void. For Descartes, there could be no vacuum, and all matter was constantly swirling to prevent a void as corpuscles moved through other matter. Another key distinction between Descartes’ corpuscularism and classical atomism is Descartes’ concept of mind/body duality, which allowed for an independent realm of existence for thought, soul, and most importantly, God. Gassendi’s system was much closer to classical atomism, but without the atheistic undertones. Pierre Gassendi (1592-1655 C.E.) was a Catholic priest from France who was also an avid natural philosopher. He was particularly intrigued by the Greek atomists, so he set out to “purify” atomism from its heretical and atheistic philosophical conclusions (Dijksterhius 1969). Gassendi formulated his atomistic conception of mechanical philosophy partly in response to Descartes; he particularly opposed Descartes’ reductionist view that only purely mechanical explanations of physics are valid, as well as the application of geometry to the whole of physics (Clericuzio 2000). The final form of atomism that came to be accepted by most English scientists after Robert Boyle (1627-1692 C.E.) was an amalgam of the two French systems. In The Sceptical Chymist (1661), Boyle shows some of the problems with Aristotelian physics that arise from chemistry experimentation, and offers up atomism as a possible explanation. The unifying principle that led to the acceptance of this hybrid atomism was the mechanical philosophy, which was becoming widely accepted by Western scientists. Despite the problems with atomism, it was clear by the end of the seventeenth century that it was a better alternative than Aristotelian physics, especially since it was compatible with the mechanical philosophy. Roger Boscovich provided the first general mathematical theory of atomism, based on the ideas of Newton and Leibniz but transforming them so as to provide a programme for atomic physics (Lancelot Law Whyte, Essay on Atomism, 1961, p 54). From the eighteenth until the mid-twentieth century, atomism was the accepted scientific view of material existence. This atomism became increasingly complex, with the addition of elementary particle theory based on quarks and leptons and other possible particles. Today the usually accepted view is known as the Standard Theory, but that standard theory is known to be incomplete. Some have proposed Superstring Theory as a better theory that—supposedly—can solve difficulties that remain with the Standard Theory. From another standpoint, the advent of quantum theory has rendered traditional atomism unsustainable. Matter is now seen to exhibit a wave-particle duality—that is, all such point-like particles are simultaneously waves whose extension in space is theoretically unbounded. Sometimes matter behaves like particles; other times like waves. Thus, the historical position of atomism should be seen as but one way of looking at a more complex reality that is both local and global, discrete and holistic at the same time. ↑ Bimal Krishna Matilal, The Word and the World: India's Contribution to the Study of Language (Oxford University Press, 1990). ↑ Diogenes Laertius, Lives of the Philosophers, ix, 35. Clericuzio, Antonio. Elements, Principles, and Corpuscles; a Study of Atomism and Chemistry in the Seventeenth Century. Boston: Kluwer Academic Publishers, 2000. Dalton, John. A New System of Chemical Philosophy. London: Dawson, 1808. Retrieved March 7, 2007. Gardet, L. “djuz’” in Encyclopaedia of Islam CD-ROM Edition, v. 1.1. Leiden: Brill, 2001. Marmara, Michael E. "Causation in Islamic Thought." Dictionary of the History of Ideas. New York: Charles Scribner's Sons, 1973-74. Whyte, Lancelot Law. Essay on Atomism, From Democritus to 1960. Middletown, Conn.: Wesleyan University Press, 1961. Democritus Internet Encyclopedia of Philosophy. Fowler, Michael. "Evolution of the Atomic Concept and the Beginnings of Modern Chemistry" University of Virginia. This page was last modified on 25 April 2016, at 20:20.